Doing performance tuning on your database is one of the most common and yet the most important activity that every database administrator (DBA) must perform on an ongoing and regular basis. Experts recommend that you regularly fine-tune databases to optimized performance. Fine-tuning helps users to run their reports and queries faster and get results quicker. This post shares some techniques for troubleshooting and tuning Oracle® databases. To start with, you need to identify the area where the problem is occurring. Possible areas that can trigger the problem include the operating system, database, memory shortages, and so on. After you have identified a problem area, you can proceed with tuning the area for maximum benefits. This blog focusses on only performance tuning. Oracle has given DBAs a few tools to help with diagnosing problems and troubleshooting performance issues. These tools include the Automatic Database Diagnostic Monitor (ADDM) and Automatic Workload Repository (AWR) reports, which you can generate for the problematic time-period and use in your analysis. You should use the tools to look for skewed or tunable components. ADDM reports reflect whether you can achieve any performance benefit by creating some new indexes. 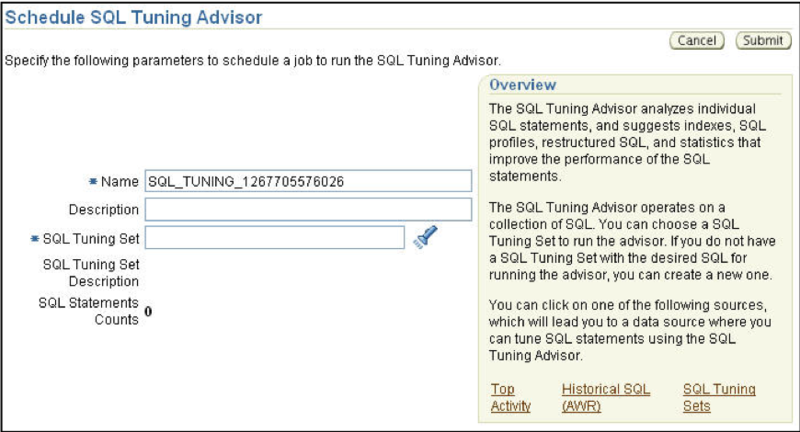 You can also run the SQL Tuning Advisor from OEM to fine tune the queries and possibly use a better execution plan. Most of the time, using a better plan for problematic SQL resolves the major performance issue. 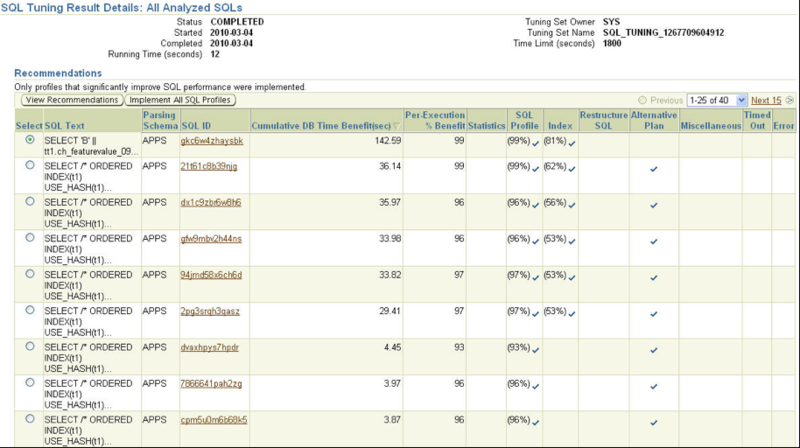 Top activity: Analyzes the top SQL statements currently active. SQL tuning sets: Analyzes a set of SQL statements that you provide. Historical SQL (AWR): Analyzes SQL statements from statements collected by AWR snapshots. 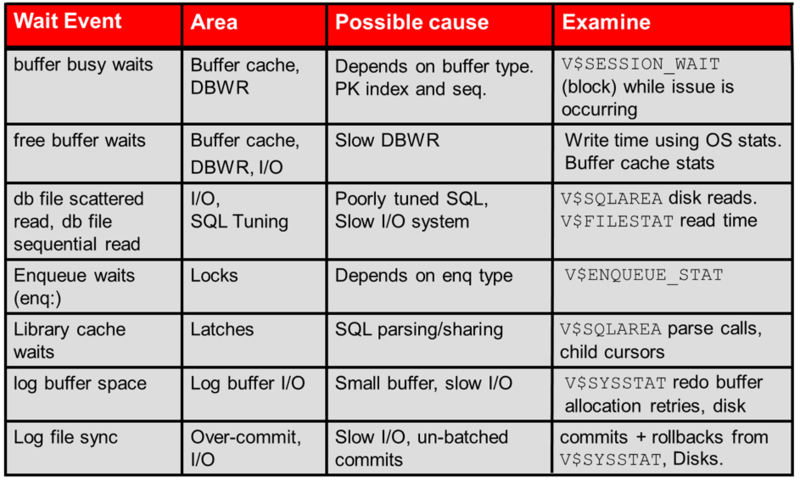 After reviewing the AWR reports, a DBA can easily identify the cache that requires fine tuning because the cache hit ratio is lower for that cache than it is for other caches. 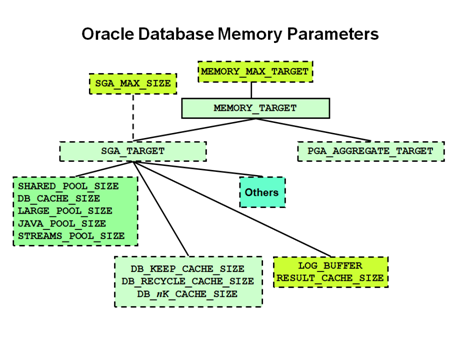 The following image shows a few of the top database parameters that you must consider for instance-wide memory tuning. Bad connection management: Developers write the code to connect to the database in the application or run queries to fetch the data from the database. After the data has been fetched and nothing more is required, the code should close the connection to the database. However, this often doesn't happen, which leads to an increased number of inactive sessions in the database. These sessions use precious resources that could have been used for other active connections. Bad use of cursors and shared pool: A cursor is a tool in the arsenal of a Developer that mostly stay unutilized. Without cursors, Oracle has to hard parse the code every time it's run. This hugely impacts the performance of SQL queries that are run repeatedly. A DBA can identify this problem by looking into the Instance Efficiency Percentages - Execute to Parse %. AWR report section. Bad SQL: The way that an SQL query is written (with join conditions to fetch the data) significantly affects the performance of that SQL, after it's executed. You should avoid full table scans for large tables. After SQL has been prepared, developers and DBAs should run an explain plan on that SQL to understand the cost of running it in the database. By using cursors, bind variables, and indexes, you can increase the efficiency. Use of nonstandard initialization parameters: DBAs should always use only standard or recommended initialization parameters. Use non-standard initialization parameters only when they are suggested by an Oracle Service Request (SR). Getting database I/O wrong: When a DBA choosing database hardware should try to distribute the database over multiple disks and involve the network team in a discussion about the speed with which data will be traveling to end users from the database server and back. A DBA should take into consideration the speed of the network switches and routers to avoid any bottleneck or performance issues. Redo log setup problems: Redo logs are required to store the data from redo buffer so that Oracle can redo the transactions in case of any crash. If the redo log size is inadequate, then multiple switches might happen in the database that cause performance issues. This also increases the load on the archive generation. Serialization of data blocks in the buffer cache: This happens due to a shortage of free list groups or undo segments. This situation arises for insert-heavy databases with a large base of active users but fewer undo segments, which ultimately leads to performance issues. Full table scans: Check for full table scans in queries by running an explain plan. Normally, a query that does full table scans reflects bad SQL design, which can be corrected by using indexes and by narrowing the data required. In few cases, full table scans can be beneficial, especially in the case of small tables. Recursive SQL: Recursive SQL can be a boon to developers if used correctly, but it can be a double-edged sword. Done right, it provides the output efficiently. Otherwise, it hugely impacts the performance of the database. In-disk sorting: In-disk sorting is a very expensive task for database. It indicates poor SQL design and bad optimization. You can identify the issue in the Instance Activity Stats – Sorts (disk) AWR report section. While DBAs must consider different areas for performance tuning, in the database world, performance tuning starts from the database and application design stage. Databases and applications that are designed with performance tuning perspective in mind are much more scalable than applications designed without performance tuning consideration. The performance tuning points covered in this blog are just a tip of the iceberg. I recommend that fellow DBAs keep reading more on the topic to take care of the database performance overall. Learn more about our database services. Rackspace has extensive knowledge of Oracle products. Learn more about how we can maximize your Oracle investment. If you have any questions on the topic, comment in the field below.